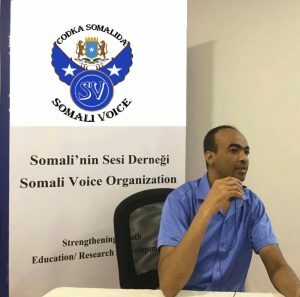 The Somali Voice is a non-government, non-profit independent organization which was officially registered in Turkey and was founded on 20th February 2015 by a team of Somali intellectuals and professionals, to encourage young Somalis to participate research, education and youth development in Somalia. To address and discuss youth and education development issues that concern to the common Somali community. To call for discussion, dialogue and engage research activities among young Somalis. Allowing young generation to discuss and address construction issues that concern to the Somali people and the development of the youth as a whole. This organization has two headquarters the main headquarter is Istanbul, Turkey and the second headquarter locates in Mogadishu, Somalia. In addition, The Somali VOICE Organization (SV) focuses on a socio-political group aimed at the proffering solution to our numerous problems as a Nation; building stronger institutions with the view to combating corruption, crime and other forms of criminalities in our society. The SV is a body of NonProfit Organizations, Activist and pressure groups in Somalia under the auspices of the Justice and Law Enforcement Reformation Organization. We humbly implore you to take a few minutes to read through our vision for building a better society and nation. We are proffering solution to our social, economic and political problems in Somalia with the view that you will find a place within the structure where you will be able to contribute your own quota to the SOMALIAN DREAM. There are many different ethnic clans in Somalia, of which the same language, Religion, and Traditions. Somalia is not divided in religion, There is no doubt that in spite of out abundant resources our nation is faced with challenges such as low productivity, unemployment, crime and criminalities, a decay of our social infrastructures and moralities. Successive leaders have acknowledged that the country is suffering from mistakes of past administration. Our main problem as a nation is identified as greed and corruption that has eaten deep into our society and has destroyed every facet of our life. The SV is, therefore, pleased to introduce our vision for a greater Somalia.